Satellite Composite "Face of the Earth"
Earth and Beyond's satellite composite is called "The Face of the Earth." It has attractive coloration with black panels along the top and bottom. 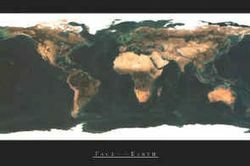 This Atlantic-centered view comes only in a paper version.